It is no secret that Walt Disney loved trains and after having huge success with Davy Crockett and the star it created, Fess Parker, Walt decided to combine his love of trains and America's obsession with Westerns to make a period film based on the 1862 Civil War military raid of the Southern railroad. 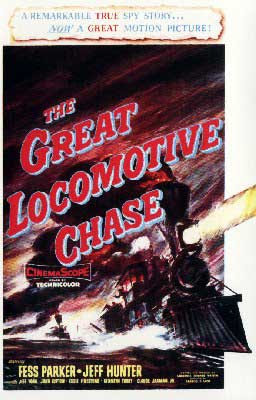 The Great Locomotive Chase was the third Disney film shot in the new CinemaScope widescreen process. Many exterior shots were done in Georgia, where the film takes place, but interiors were done at the Walt Disney Studios in Burbank, CA. Walt was busy with his theme park, Disneyland, during filming, so he didn't have a very active role in it. But director Francis Lyon said that he was active in the story process and visited the set in Georgia for a weekend. The film is narrated by William Pittinger in flashback form. James Andrews is a member of the secret service who is planning on leaving and joining the war when he is given a mission to lead a group of men as spies to destroy the Southern railroad system. They encounter many exciting and perilous obstacles in their quest, eventually leading to a chase by the train's conductor, William Fuller. Fuller succeeds in stopping the mission as a hunt goes on to find the men who stole the train. Many are rounded up, including Pittinger and Andrews. A prison escape it foiled and only some of the men get away, but Andrews valiantly tries to fight the guards off. It is learned through flashback that he and the others were executed. The film ends with the surviving men receiving medals of honor. The Great Locomotive Chase premiered on June 8th, 1956. Critics loved it because it was exactly the kind of big budget live action movie they expected from Disney. Audiences loved it too and it was a big success during its theatrical release. Surprisingly, it was never given a theatrical re-release and over time, it has become forgotten by most. As a film, it is mostly enjoyable. While the acting isn't as great as it could have been, the cinematography provides a visually pleasing experience thanks to the natural environments and Peter Ellenshaw's masterful matte paintings. The film is full of lots of brisk action sequences that will keep you entertained. Its only real downfall is that after the chase is over, none of the action is able to top it. As an audience, we are spoiled by big action sequences coming towards the end of films, but here they happen a good 15 minutes before the end, causing the ending to feel a bit weak. In addition, the fact that they didn't succeed and the film's main character dies makes it feel a little bit pointless, but overall its a good movie. Walt Disney's The Great Locomotive Chase was released on DVD in 2004. It is accurately presented in its original CinemaScope aspect ratio, but it is unfortunately presented letter boxed, meaning it is not formatted to fit widescreen TVs. The film is available on iTunes in widescreen, where it is also available in HD.